1/ Mix the Kosher salt, dry oregano, powdered garlic and onion in a bowl. 2/ Sprinkle this evenly over the meat and rub in thoroughly. 3/ Put the mango jam, ketchup, butter, shallots and crushed garlic in a pan. Heat over medium fire for about 10 minutes, until desired consistency. 4/ Program the application to the “Veal” setting and insert the meat°it probe into the thickest part of a veal chop (without touching the bone). 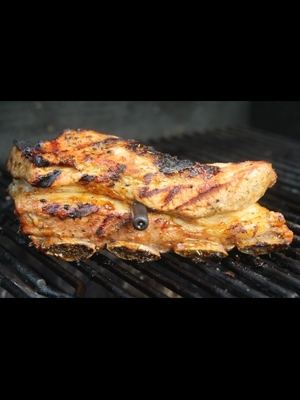 5/ Over indirect heat on a barbecue or in an oven heated to 350°F/180°C until probe registers about 225°F/125°C. 6/ Glaze the veal chops with half of the mango glaze for another 10-15 minutes. 7/ Remove the meat from the heat once the probe sounds the alert. Glaze the chops with the rest of the mango mixture. 8/ Then cover with aluminum foil and let the meat stand for 15 minutes before serving.